A few days ago James Troup at Dubois Yachts promised me that he was on the verge of signing new central agencies and today he's as good as his word as he sends in details of his latest signing, the 40m sailing yacht Tenaz. Tenaz was launched as Mamamouchi by Pendennis in 1996 to ABS class and MCA compliant and acquired by her current owner in 2007. 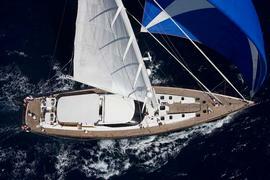 This superyacht has recently undergone an extensive refit at Pendennis over the winter of 2008/2009. Tenaz is now offered in excellent condition with all the benefit of a refit where the ‘behind the scenes’ mechanics and infrastructure have been comprehensively refitted and replaced where necessary. She has a sleek profile which gives wonderful visibility forward from her huge cockpit and has earned a superb reputation for her performance under sail. Capable of sailing the world in comfort, speed and style, Tenaz sleeps seven guests in a master, two twin and a single cabin and is on the market asking €8.25 million.